Yes Mesothelioma is classed as a rare disease which I find so hard to agree to. Asbestos has caused such a lot of health problems. I include a blog that I helped with by answering questions and sharing my story. The last day in February marks an awareness holiday called Rare Disease Day, a time dedicated to highlighting rare diseases. Although as a whole, rare diseases affect 30 million Americans, they often receive very little attention. These awareness holidays are the one time each year where the rare disease community can come together as a whole and shed some light on their struggles and triumphs. This year’s theme is centered around the importance of research, and for a rare cancer like mesothelioma, research and development of immunotherapy has been invaluable. As is the case with many rare diseases, the public is largely unfamiliar with this rare cancer. Mesothelioma is often confused with lung cancer. Because 85% of diagnosed cases are pleural mesothelioma, which develops in the lining of the lungs, mesothelioma as a whole is often thought of as a lung cancer. However, mesothelioma can also form in the linings of other organs such as the heart or the abdomen. Additionally many of the symptoms of mesothelioma are the same for lung cancer. What causes mesothelioma? 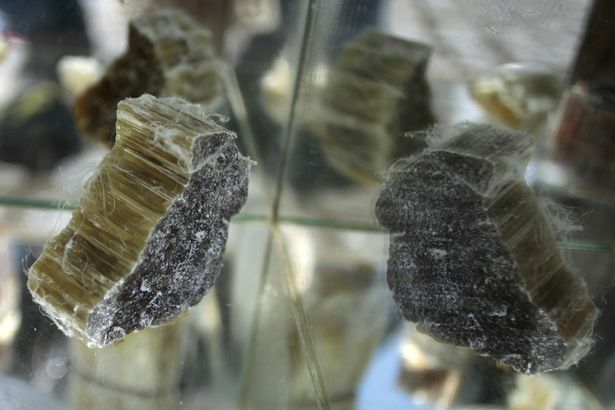 The only known cause is exposure to a fibrous mineral called asbestos. When asbestos is disturbed, small fragments can detach themselves and become airborne. These fibers can be inhaled and become lodged in the lungs, scarring the tissue and leading to the development of tumors; however, it can take decades after asbestos exposure before symptoms arise. This makes it difficult for patients to pinpoint how exactly they were exposed. Asbestos was widely used in many different industries because of its unique properties–specifically a resistance to fire and heat and an overall durability. Unfortunately, it’s precisely the properties that make asbestos effective for industry that also make it dangerous. Asbestos cannot be broken down and disposed of by the human body, so instead, it remains trapped and results in cancers like mesothelioma. One of the struggles with mesothelioma is that it’s exceptionally difficult to diagnose. Mesothelioma symptoms are nonspecific, meaning the symptoms could be the result of many different conditions. Symptoms include chest pain, fatigue, and shortness of breath – which can all be associated with more common ailments such as the flu. Additionally, these symptoms may not even be present until the cancer has significantly progressed. Another challenge for this cancer is that although the dangers of asbestos are well documented and have been for decades, asbestos has not yet been banned in the United States. What are the new developments in this field? In early 2016, former Vice President Joe Biden announced the Cancer Moonshot, now known as Cancer Breakthroughs 2020, which is an initiative with the goal of eradicating cancer. Through investments of federal funding, this program supports cancer research that will hopefully lead to the development of better treatments. One of the largest pieces of this initiative is immunotherapy, which uses the body’s own immune system to combat cancer cells. Immunotherapy is a promising treatment for mesothelioma patients. One drug in particular called Keytruda has already been approved for non-small cell lung cancer and head and neck squamous cell carcinoma. Keytruda is now being tested to see if it can also be an effective immunotherapy treatment for mesothelioma. Trial participants can attest to the success of the drug. Many people with rare diseases are misdiagnosed, and even after a proper diagnosis, have severely limited treatment options. This is often on top of the news of a poor prognosis. Mesothelioma patients, for example, are typically given less than two years to live. This can make it difficult for patients to have hope for survival. But immunotherapy and other developments in the treatment of cancer and rare diseases are changing all of that. For Mavis Nye, immunotherapy seemed like the “treatment of the future” and her best chance at regaining her health. She said “It was a breeze after chemotherapy. No sickness no neuropathy…You live life normally at last…” Nye did note that since immunotherapy is still in the clinical trial stage, it is not yet widely available. But hopefully the positive results continue and immunotherapy can become a viable option for more patients. One-third of all new drugs that have been approved by the FDA are specifically for rare diseases. Hopefully, the development of better treatments will lead to longer life-expectancy and improved quality of life. This is the major source of hope that patients of rare diseases have been looking for. And none of this would be possible without the financial support and public awareness about the need for better treatments. Rare Disease Day is one of the few times that these conditions are given the attention they need, making this holiday exceptionally important for patients. As a whole, there are more people with a rare disease than there are those affected by HIV, heart disease, or stroke. With such a large portion of the population being part of the rare disease community, it makes sense that these diseases gain more attention. Being able to raise awareness for rare diseases is what this holiday is all about! Yesterday was a calm day and a better day after Doris had calmed down travelled East and away from the UK. She had left a trail of damage behind her. Thats a lot of damage but we had a calm day and lots of sunshine so we spent some time in Whitstable, it was very busy. We were amazed at just how many people were in town, we had taken Louis with us. So many dogs passed us by I was so pleased Louis behaved and greeted each one as we passed with a wag of the tail. He hates the traffic though and our narrow street is hard to navigate when there are so many shoppers. We only had to go to the bank and then went on out to the field for Louis to run off lead, free and happy. Asbestos in Schools is back in the news with a Gov Report out. Seems that at last they realise just how bad the situation is and we will have to wait to see what happens now. Asbestos in schools is a “serious” problem which could threaten the health of children, a Government report has found, as it concluded that thousands of schools are failing to follow safety guidelines. One fifth of schools which responded to an official survey were found to be “not fully compliant” with asbestos procedures, leaving over a million children potentially exposed to dangerous fibres. Of those, over 100 schools were deemed a “significant cause for concern” and required government intervention. The Department for Education (DfE) said it emailed those schools and received “reassurances” the asbestos is now safe. School leaders have branded the report’s findings “deeply concerning”, and urged the DfE to instigate a works programme that would see asbestos removed from all schools. Most victims die within 18 months of diagnosis, but it often does not appear until around 40 years after the person first breathes in the dust. The EFA is part of the DfE and oversees funding for all schools, academies and colleges in England. Earlier this week a report by the National Audit Office (NAO) found that “asbestos is a significant, and potentially dangerous, issue in many buildings, including most schools”. According to the National Union of Teachers, 319 teachers have died from mesothelioma since 1980. It is estimated that for every teacher’s death, nine children will die, meaning over 100 people will die every year in the UK as a result of exposure when they were at school. “These results seriously call into question the DfE’s fundamental assumption that asbestos can be managed safely left in situ, as clearly this is not happening in too many cases,” said Chris Keates, general secretary of the teaching union NASUWT. This means that true number of schools who do not comply with asbestos safety procedures is likely to be far higher, as the report notes that there may be a “selection bias” towards schools that “already manage asbestos well”. Three quarters of schools contain asbestos, but the Health and Safety Executive say that it only presents a risk if it is disturbed or damaged, which risks fibres being released into the atmosphere. A DfE spokesperson said: “The health and safety of children and staff in our schools is vital – that’s why we are investing £23 billion in school buildings by 2021. This will help ensure asbestos is managed safely and that the amount in school buildings continues to reduce over time. 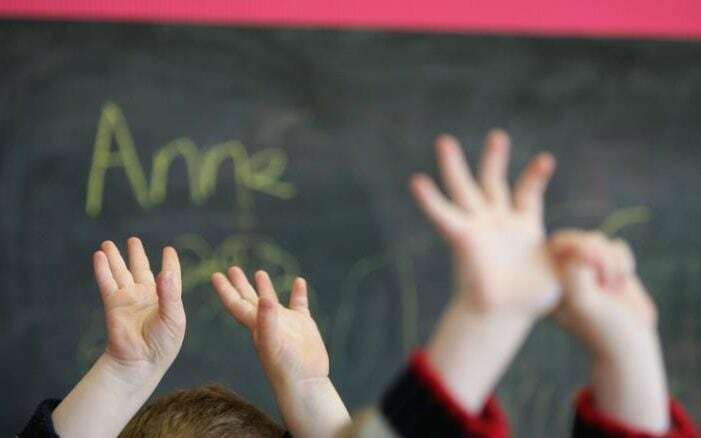 Schoolchildren and teachers are being put at risk of asbestos exposure in around one in five schools across England, according to a new report released today by the Education Funding Agency (EFA). Nineteen per cent of schools have not been safely managing asbestos risks and in more than 100 schools the situation has been so serious that the Department for Education (DfE) had to step in. More than 5,500 schools took part in the research into asbestos management in schools, which was conducted last year. Of those, 4,646 (83.1 per cent) reported that asbestos was present. The research results, released today, also reveal significant failures to guard against the risks of asbestos. “Around 20 per cent were not fully compliant, in that they did not have fully documented plans, processes and procedures in place at the time of the data collection; or did not know if asbestos was present,” the report states. Concern over the number of schools which were not properly managing the risks of asbestos has prompted the EFA to issue new guidance. This includes details such as reminding teachers not to put drawing pins into walls as this can release asbestos fibres where the material is present. The data collection was a voluntary exercise so the true number of schools failing to comply with regulations “could be substantially higher, with hundreds of schools putting pupils and teachers at risk by failing to manage asbestos effectively”, she warned. “Asbestos is lethal. The only safe asbestos is removed asbestos. The DfE must bring forward proposals for the phased removal of all asbestos in schools without delay,” said Ms Keates. Its been a busy week so far. Tuesday we had a meeting in Richmond to go to. It is an easy journey to Victoria then underground to Richmond. The Office we had to go to is overlooking Richmond Green by the Thames. It was sunny so it looked so nice. Fancy seeing this view everyday as you worked. Even though it was a meeting they had a cake for Ray as it was his birthday the next day so there was a lot of laughter as he blew out the candles. We were there 2 hours and then we headed home in the rush hour which wasnt as bad as we thought it might be. As Ray got off the train at Whitstable I reminded him about the huge gap I said “mind the gap” as we stood waiting to pull into the station. A woman was listening and offered to drive ray home. He must look a lot older to people and with his back bad and a walking stick she was very worried about him. I said we had the car in the car park but thanks anyway. I tell you it’s not so bad being old people are so kind, but it worries you that you must look old as people give up their seats on the train and now even a lift home. We must have a facelift ha! ha! So yesterday on Rays birthday we went to Faversham to meet my brother. We had nice walk through town and he went to the model shop for some glue but they didn’t have it. Why has the glue got short?? I don’t understand. It is coming in March. No shops have it so he will sort it out on-line. have you seen the price of Railway models now. I was shocked. I walked around and was amazed. We should have looked after our own things better as they would be worth a fortune. 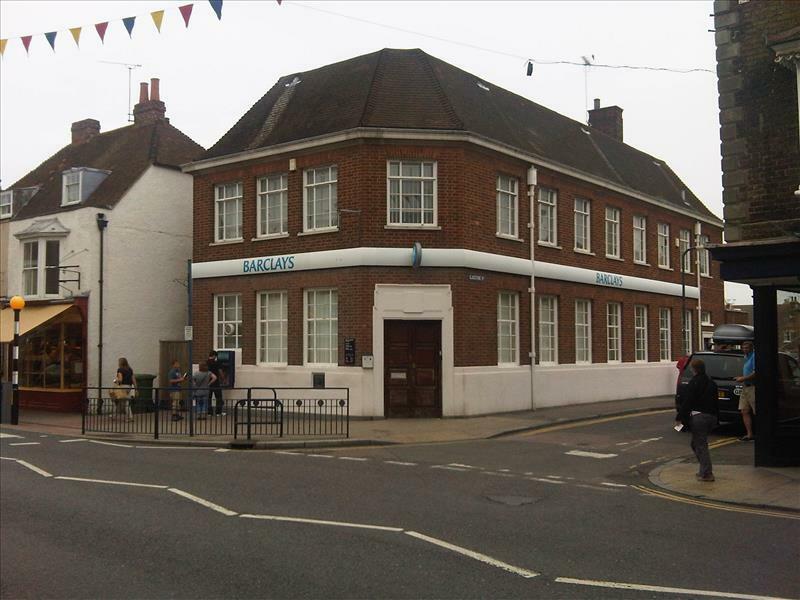 We walked around to my Bank and it was closed –Wednesday closing I didn’t know that happened nowadays how quant. Described by others as a jewel of Faversham, this hand pump was built in 1855, although it is known that a water pump has been on this site since 1635. It was once a water source for the Market Place area, and despite piped water being available to the town from 1864, it was still being used in living memory, although no more. The pump once had a lantern at the top, and it is hoped one day to replace that feature. Folklore say’s that on Christmas Eve, beer, not water, has been known to flow from it, although being the home to Britain’s oldest brewery, Shepherd Neame, it may well have a ring of truth about it. At least we were able too have lunch at the Swan This pub has closed (2009) and undergone conversion to a cafe. They have kept the wooden floors it is so nice and old. and the food was just great. So all full up we walked back to the cars and went our separate ways. I had a Telephone Conference in the afternoon that I was so worried about doing but in fact it all went very well and it did save another journey to London. You dial a number and enter a pin number and there you are talking to 5/6 people Technology is amazing today. I’m so pleased I have a chance to keep up with it all. Today we have woken up to a storm called Doris. It is so bad that our son phoned to make sure we were OK and as he spoke to me a branch of a tree fell down by the side of him and made him jump. He said the roads are full of trees though and it is so dangerous out there. Gosh looking at this link I didn’t realise just how bad it was so think we will stay in. Snow wind and rain mother nature is cruel at times. Senior meteorologist Greg Dewhurst said the storm would bring “very strong winds and gales”, and that the centre of Doris was expected to pass over into the North Sea at around lunchtime. Snowfall is expected on higher ground in Scotland, affecting Falkirk, South Lanarkshire, East Ayrshire, North Lanarkshire, Edinburgh, Dumfries and Galloway and the Lothian region. Heavy rain is also likely across the UK, with some snow possible on high ground in parts of north Wales, north-west England, the Midlands, Yorkshire and East Anglia. 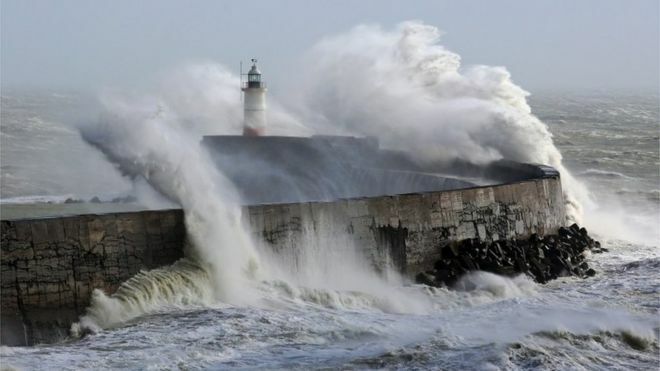 The strongest winds are expected to be “short-lived” and gone by the evening. We can’t believe the wonderful weather we have. It’s warm and the sun is beaming every day. The Seagulls have flown over each morning squawking away waking me up as they fly to the Beach. They are always sitting watching us as we take Louis out. Yesterday I saw Catkins hanging, we call them lambs tails and the little lambs are being born in the fields around us. We are so lucky to live at the coast and yet have the countryside on our doorstep. Today I have been loading on new Mesowarriors to our groups on FaceBook. I dont know if its because we are being found easy. I do know MesoUK passes them our details and so many friends add them I do hope it’s that and not that the figures are still going up high. We keep being told that a peak will be reached but to be honest I dont agree with their figure. the 2,556 deaths in 2013, and 2,549 deaths in 2012. The continuing increase in annual mesothelioma deaths in recent years has been driven mainly by deaths among those aged 75 and above. In 2014 there were 2,101 male deaths and 414 female deaths. There were 2,130 new cases of mesothelioma assessed for Industrial Injuries Disablement Benefit (IIDB) in 2015 compared with 2,215 in 2014. Men who worked in the building industry when asbestos was used extensively are now among those most at risk of mesothelioma. Mesothelioma in Great Britain: annual deaths, IIDB cases and projected future deaths to 2030. I hope they are right but wonder if they have included DIY and The people who work stripping the Asbestos out of the buildings . Whilst out on site last week, one of our surveyors found AIB padding on this old ironing board! And Asbestos is still heavy in our schools causing the deaths of Teachers and staff and so many Children will suffer in 20/30years its no wonder we have doubts. So many people are fighting the cause around the world, so many people are suffering with Mesothelioma they are all so admired within our community. Mesowarriors are so great in fighting not only Mesothelioma but also the war on Asbestos. They, with their Carers and friends, raise not only Awareness but also funding for Research into the disease. Firstly it is important to understand that cancer is not a single illness, there are many different types and mesothelioma is just one type. 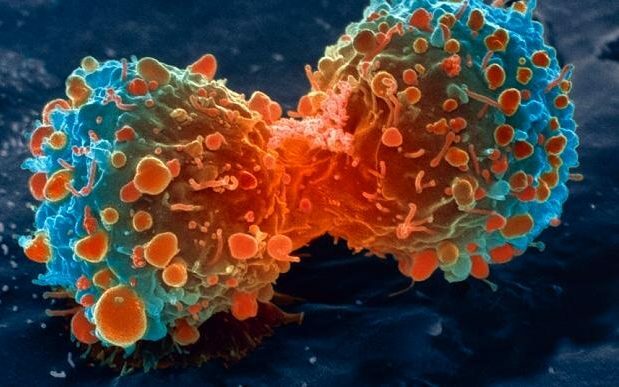 Our bodies are made of tiny building blocks called cells, cancer is a disease of these cells. Cells from different parts of the body look and work differently and millions of new cells are made everyday to replace those lost through old age or wear and tear. Throughout the body new cells are produced when existing cells divide into two and there is normally a perfect balance between those that are dying and those that are dividing. This vital balance is controlled by a very complicated process, if control of this process is lost it can lead to too many cells being produced which results in a tumour. Most tumours are not cancerous (sometimes described as benign) and they remain in the area where they first developed. A wart is a common example. The development of cancer involves a change in the quality of the cells as well an increase in the quantity. They become more aggressive, destructive and independent of normal cells. They are able to invade surrounding tissues, glands and blood vessels and thus spread away from where they started to divide and grow. When the cancer cells reach a new site they may go on dividing and form a new tumour, this is often referred to as a secondary or metastasis. In the UK about 2500 people a year are diagnosed with mesothelioma. It is also known as ‘diffuse’ or ‘malignant’ mesothelioma. Mesothelioma is a form of cancer that affects the Mesothelium. The mesothelium also surrounds organs within these cavities for example the heart, lungs and intestines. It is far more common to have mesothelioma in the chest than in the abdomen. There is approximately 1 case of peritoneal mesothelioma to every 12 cases of pleural mesothelioma. Mesothelioma is more common in men than in women and nearly half of the people diagnosed with the disease are over 75 years old. The pleural lining has two layers: the visceral (inner) layer is next to the lung and the parietal (outer) layer lines the chest wall. The pleura produces fluid that lubricates the space between the two layers, this allows the two layers to slide comfortably over each other as we breathe in and out. Pleural mesothelioma causes the pleura to thicken. This thickening of the pleura might begin to press onto the lungs or attach itself to the inside of the chest wall. In either case the expansion of the lung becomes progressively restricted by the tumour. Fluid, sometimes several litres, can collect between the two layers of the pleura; this affects the lungs ability to expand and causes the person to feel breathless. This is known as a pleural effusion. The peritoneum also has two layers the inner (visceral) layer which is next to the abdominal organs and the outer (parietal) layer which lines the abdominal wall. Peritoneal mesothelioma causes the peritoneum to thicken and fluid to collect in the abdomen. This collection of fluid is called ascites and causes the abdomen to swell. Because pleural mesothelioma is more common and often spreads to the peritoneal cavity, it is sometimes necessary to determine if pleural mesothelioma is the primary cancer. The commonest symptoms for pleural and peritoneal mesothelioma are listed here, but there may be others. You can find out more about treatments for these symptoms in the Controlling Symptoms section. A Diary Of A #Mesowarrior Living With #Mesothelioma #Asbestos. Louis New Toy Has Scared The Delivery Man. My Pet Hate Fly Tippings In The News. We woke up to a lovely sunny day.so with housework done and then lunch we escaped to Tankerton Slopes to walk Lou. We had a parcel delivered and the driver said what on earth is in there. It keeps making noises and scares me, I’m glad to get rid. Can you hear how it sort of talks and the poor delivery man has had that in his van We really laughed when he told us. With housework done and then lunch we escaped to Tankerton Slopes to walk Lou. As we traveled through Whitstable we were surprised at how much traffic there was and then it dawned on us that it was half term. Our town was invaded by day trippers. We walked on the slope and took in the warmer sea air. Oh! spring is around the corner. FEARS over health have been raised after potentially dangerous asbestos was found among mounds of rubbish. The load had been dumped by fly-tippers on a grit storage site on a layby on the B1032 between Holland-on-Sea and Great Holland. 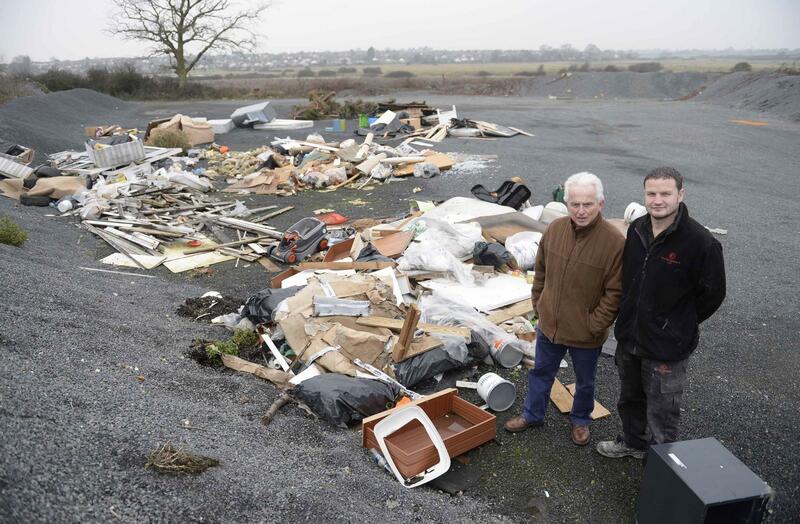 Concerned residents said the pile of rubbish has been building up for the past two weeks and they called on the councils to step in to clear it away. Albert Crispin, 74, of Great Holland, first found the rubbish and he reported it to Essex County Council. You can’t cover it with cameras as it is usually in out-of-the-way places but cameras are on roads do they research those. They do search through the rubbish for any receipt or letter. But these are mainly builders who have charged to take the rubbish away dump it and sometimes the work for the Council, so they get paid a lot of money to take it away. This is crazy. Please report anytime you see a pile of rubbish its not only about keeping the place tidy its about keeping people safe. 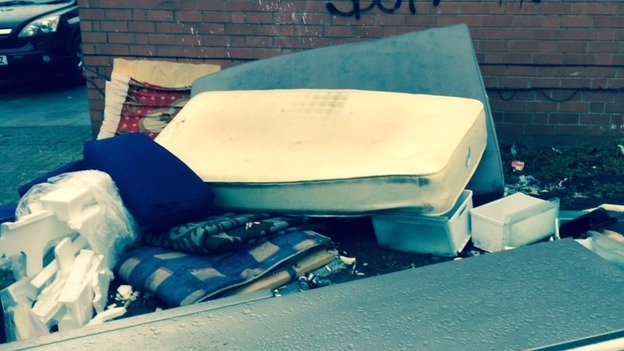 An ITV News investigation has revealed fly-tipping is on the rise in some parts of the UK. A Freedom of Information (FOI) request was sent to councils across Britain asking how many incidents of fly-tipping were reported between November 2015 and December 2016. Out of the 264 councils that responded to the request, Haringey in London had the highest number of fly-tipping incidents. 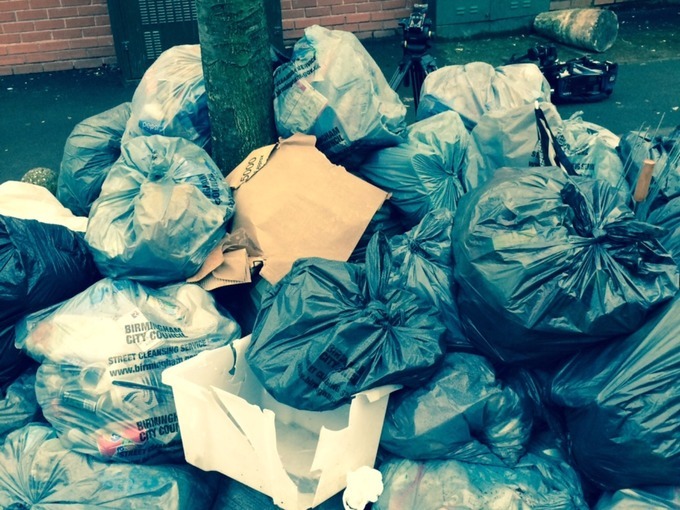 incidents of fly-tipping were reported to Haringey Council. Outside of London, Manchester was second with 30,386 reported offenses, averaging 77 a day. Birmingham dealt with more than 21,000 incidents – a decline of 13% but still an average of 53 incidents a day. 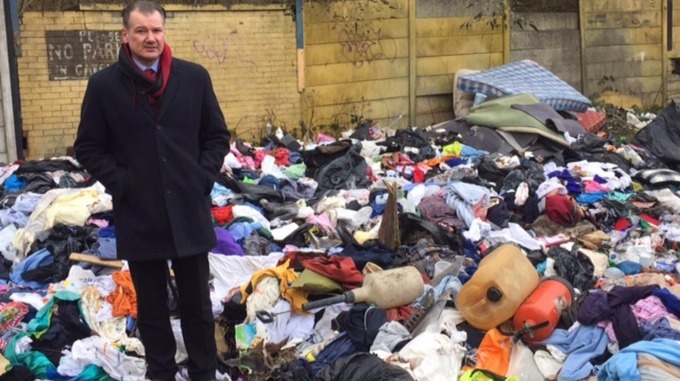 Allison Ogden-Newton, chief executive of Keep Britain Tidy, told ITV News illegal dumping of waste has reached crisis levels. “Local authorities are overwhelmed with instances of criminal fly-tipping and we need to address this urgently,” she added. You can report fly-tipping to your local council by visiting its website or on the government’s dedicated site. Large-scale illegal dumping or other waste crime can also be reported to Crimestoppers anonymously on 0800 555 111. It is a cold day and we have had snow today so it has left me reading all sorts of information on the computer. I find it so sad the way our past relatives worked in such danger with no protection and suffered so much illness. Asbestos is my subject that I soak up every bit of info and I was reading how women went out to work in the wartime so they too worked in such dangers. Away from the kitchen and house work they breathed in the dangerous fibers that their menfolk were breathing in. So not secondary contamination anymore from what was bought into the home but out there in factories etc. We forget that so many women did work so that it filled the gap when their men were enlisted into the forces in wartime I share it here with you. As World War Two raged on throughout Europe and the Pacific, men were called up to fight for their country. An often overlooked and understated element of the war effort has been the contributions of women on the homefront during wartime. As men left their factory jobs to go and fight, women stepped up to produce the heavy machinery needed for the war and at home to keep the country running. Women quickly picked up and excelled at historically male-dominated trades such as welding, riveting and engine repair. Women were essential for the production and supply of goods to our troops fighting abroad. Their efforts during wartime refuted the misconception that women are incapable of manual and technical laboring. Though these women showed up at the factories to offer their services for the war effort, some employers still tried to deny them equal pay. Before the war, employers often classified work into “male” and “female” jobs, paying the “female” jobs less. When the war came, employers automatically classified the newer positions as “female” jobs so they would not have to pay as much. Some union officials attacked these classifications and demanded “equal pay for equal work”. These officials were not only interested in securing fair pay for the women. They were also concerned that after the war, veterans would return to work and find that they had suffered pay cuts and reductions because their jobs had been reclassified as “female” positions while they were fighting overseas. After the war, many women faced problems when their jobs were given to male veterans who were returning to work. Women who wished to remain in the workforce were transferred back to “female” jobs which received less pay, and often did not have union representation. For decades, people have believed that only men are diagnosed with mesothelioma. This is false. While men are three to four times as likely to be diagnosed, women are still at risk for mesothelioma resulting from asbestos exposure. Most women with mesothelioma are exposed one of three ways: Secondary exposure, environmental exposure or on-the-job exposure. People often underestimate the role of women in the asbestos industry, but many women began working in factories during WWII. Secondary exposure is the most common way women came into contact with the deadly mineral. This type of exposure usually occurs when a friend, family member or loved one brings asbestos fibers into the home (usually on work clothes) from an exterior setting. Environmental exposure can vary from place to place based on what naturally occurring asbestos is present and if there were any mines in the area. In one study aiming to show the effects of environmental exposure on women, doctors analyzed statistics from an Australian asbestos mining town. Nearly 3,000 women and girls had lived in the town between 1943 and 1992. Through 2004, malignant pleural mesothelioma accounted for eight percent of all deaths in the group of women. Young girls often performed cobbing, the method used for separating asbestos from crude rock. Women can also be exposed to asbestos on the job. Historically, occupations commonly exposed to asbestos were filled with men, but some women still took on factory roles that led to dangerous exposure and eventually a mesothelioma diagnosis. In more recent times, women are at risk for asbestos exposure in many older homes and public buildings, including city halls and schools. Women are also at risk for asbestos exposure during home renovations and DIY projects. People unaware of asbestos in their homes may disturb asbestos materials, which releases airborne asbestos fibers. Women are generally susceptible to the same types of mesothelioma as men. The most common type in both women and men, pleural mesothelioma, affects the lining of the lungs. Peritoneal mesothelioma, which affects the lining of the abdomen, is more common in women. Interestingly, pleural mesothelioma occurs five times more often than peritoneal mesothelioma in men. In women, the pleural type occurs two times more than peritoneal. Both of these mesothelioma diagnoses can be attributed directly to asbestos exposure. On the other hand, well-differentiated papillary mesothelioma (WDPM) usually develops in young women, typically in their 30s, and it does not have a strong connection to asbestos exposure. Although WDPM mostly forms in the lining of the abdomen, it has been diagnosed in other areas, such as the lining of the lungs. Those diagnosed with this cancer usually have a better prognosis than average mesothelioma patients. WDPM patients have life expectancies ranging from three years to more than 10 years. A Diary Of A Mesowarrior Living With #Mesothelioma #Asbestos Two Mesowarriors have told their very powerful stories. Yesterday we had two wonderful Mesowarriors who have talked to raise awareness. I know how hard that is to tell your story and to draw attention to your life. We do it though and we should tell our stories as we have to show people the human side to Mesothelioma. To the Patient. The first was Kirsty who I made friends with when I read her Facebook and the devastating story of how she copes daily with Peritoneal and a small child. She made me cry one day when she asked advice of how could she help her little daughter to remember her. I and others suggested a memory box and she soon arranged that. We have chatted about weight and diet all things this young woman should not be having to chat about. A single mum has been told she will likely be dead before Christmas as she wastes away from an asbestos-related disease. Kirsty List, who is only 33, has revealed her battle with the deadly disease, as the cause of her illness remains a mystery. Kirsty, who has a five-year-old daughter, Aimee, was diagnosed with mesothelioma – a cancer of the lining of the body’s organs – after she began feeling unwell in September 2015. She was initially diagnosed with gallstones but doctors discovered a tumour around her gallbladder when they attempted to remove her gallbladder during surgery. Kirsty, of Exeter, Devon, told the Express & Echo : “It was only when they went to take out my gallbladder that they found a tumour around it. Six weeks later she was left stunned when doctors delivered the devastating news. She said: “My consultants said I was suffering from mesothelioma. I was incredibly shocked because it’s something you hear in older people, not younger people. I didn’t know anything about asbestos disease. Kirsty believes she was exposed to it either when she was a pupil at school in Reading or North Devon, or while working in pubs. 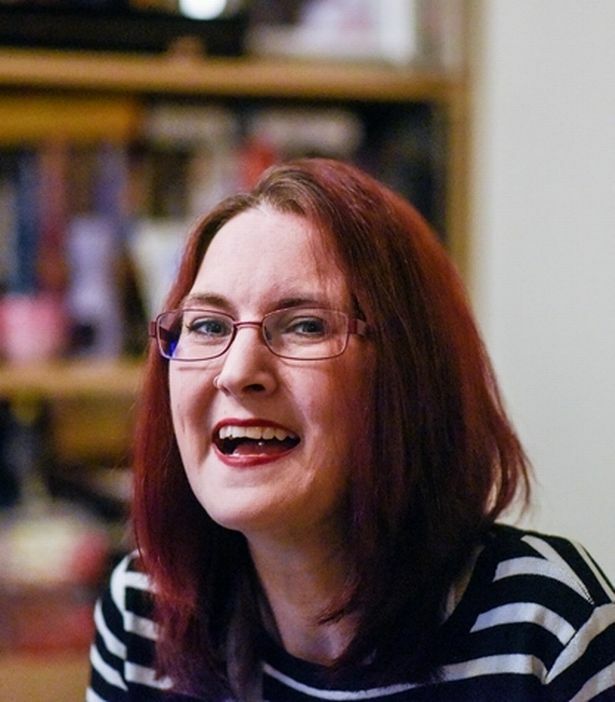 There are three types of asbestos-related lung disease and the type Kirsty has peritoneal mesothelioma which is cancer of the abdominal lining. To treat the disease, Kirsty has tried five different types of chemotherapy but she says none worked to any great extent. She received her last course almost a year ago and had been on palliative care since. Last December Kirsty was told she does not have long left to live. She said: “It was a conversation I asked to have with my consultant and I felt ready to know. Kirsty said her health has been gradually deteriorating since her diagnosis and even within the past two weeks she has noticed a difference. She added: “It’s the pain and exhaustion that’s so hard to live with. I’m on quite a lot of pain medication and I feel tired all the time which makes it hard keeping up with my daughter, but luckily her dad, my ex-partner, is very involved in helping out. “I walk with crutches now because I can’t walk very far without having to sit down. “I do have a wheelchair but I’ve not braved using it yet. I have been on a mobility scooter in Exeter city centre but I felt like people were looking at me and wondering why I was using it at my age. “At the age of 33 it’s kind of embarrassing. To look at me you would think there’s nothing wrong and it makes me feel like having a sign on my back saying, ‘I’m dying, leave me be!’. Kirsty is focusing on keeping life as normal as possible for her daughter. She said: “Aimee knows everything up and understands that I’m dying, and most of the time she is okay about it. The mum has received a large amount of compensation from the government for having an asbestos-related illness. The money has been put into a trust fund for Aimee. In the future Kirsty hopes more will be done to raise awareness about where asbestos is to help keep people safe, and not suffer like she and her family is. She said: “I would not necessarily want asbestos to be taken out of all buildings as I know that would be incredibly impractical. But I would like to see it become part of everyone’s induction process when people start a new job. “If asbestos is in a building everyone should be aware of where it is and how it should be treated to keep themselves and other people safe. It has to be a group effort. Then there was another story of another Mesowarrior A bubbly woman that I’m friends with on Facebook. her story is like mine as we washed clothes and hey ho! we have Mesothelioma when we should be enjoying retirement. A mother-of-three believes washing her late husband’s asbestos-ridden clothes caused her incurable cancer. 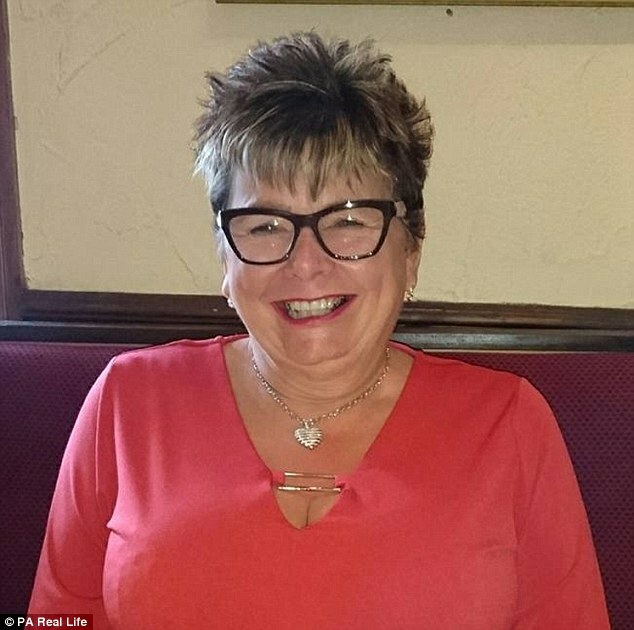 Vivienne Swain, 60, has mesothelioma – a form of the disease that affects the lining of the lungs and is often linked to chemical exposure. She would often come into contact with what she believes to be asbestos when she washed Michael Power’s clothes. 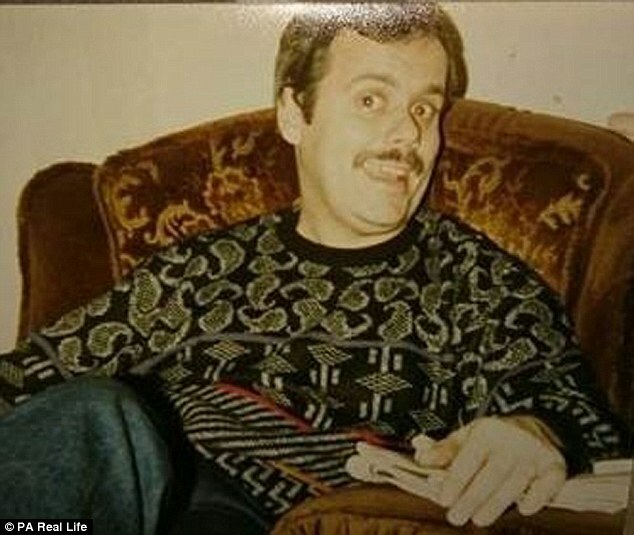 The former joiner, who worked for Manchester City Council in the 1970s, died from a brain disease in his early forties. 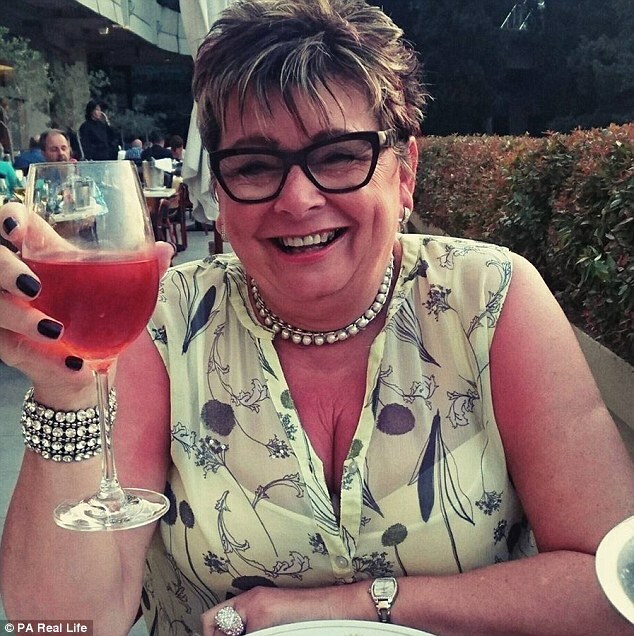 But after struggling to breathe, Ms Swain sought medical advice herself before being told that she had just three years to live when she was diagnosed in August 2015. Now she is appealing for people to support her claims that she developed the disease through washing dust off Mr Power’s clothes. Ms Swain, from Rochdale, said: ‘I would shake the overalls before washing them and they would be heavy with dust – so much so that it would cover the kitchen floor, and I’d have to sweep it up. Previously fit and healthy, she began feeling wheezy in early 2015 – but thought it was because she was looking after a hamster at the time. Visiting her GP, she was given an inhaler and her symptoms eased off temporarily. Then, in May of the same year, she went to the Greek island of Rhodes on a family holiday and found herself getting out of breath easily. ‘The hotel we always stay at is up a hill. I’ve never had any problems before, but found myself wheezing and having to stop,’ Ms Swain said. Back home, she visited Rochdale Infirmary for an X-ray where she assumed it wouldn’t be anything serious. But, after studying the scan, doctors admitted her as an emergency patient. They told her that it looked like a third of her lung had collapsed and asked her if she had suffered a fall or had knocked herself. However, she had no recollection of any such events and was transferred to Fairfield General Hospital in Bury. Over the next few months, she underwent a string of tests – but everything kept coming back negative. Then, after undergoing further testing at Wythenshawe Hospital she received her diagnosis three weeks later. ‘I was told it was incurable, and a cold feeling went through my whole body,’ she said. Following her heartbreaking diagnosis, Ms Swain was fitted with a pleural drain to help prevent a build up of fluid on her lungs. Her partner, Ian Johnston, 63, was taught how to drain it, which he had to do roughly every three to seven days. Next, she began chemotherapy, which she underwent every three weeks until October 2016. Doctors have since told her that her cancer was most likely caused by asbestos exposure, which she believes was through washing her late husband’s clothing. Mesothelioma is a type of cancer that develops in the lining that covers the outer surface of some of the body’s organs. It’s usually linked to asbestos exposure. More than 2,600 people are diagnosed with the condition each year in the UK. Most cases are diagnosed in people aged 60-80 and men are affected more commonly than women. Unfortunately it’s rarely possible to cure mesothelioma, although treatment can help control the symptoms. The symptoms of mesothelioma tend to develop gradually over time. They typically don’t appear until several decades after exposure to asbestos. Following her diagnosis, she contacted specialist asbestos disease solicitors Thompsons in Manchester to investigate her case. Now, she is urging others who worked for Manchester City Council as joiners from 1969 to 1977 – particularly those that may have known her late husband – to come forward with information. 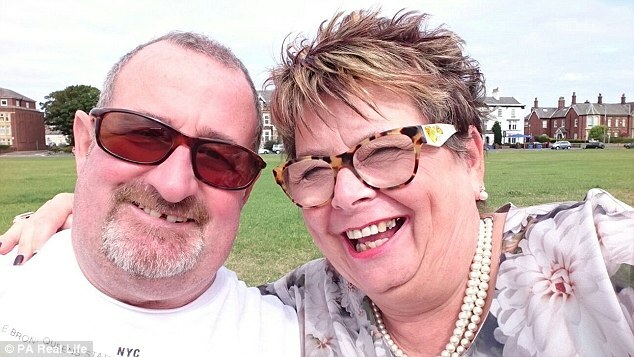 Determined to carry on in the face of her devastating illness, she hopes compensation will help her fund treatments that aren’t currently available on the NHS, but could potentially prolong her life. She is currently working closely with charity Mesothelioma UK, raising awareness of her type of cancer, and also praised Greater Manchester Asbestos Victim Support Group for the invaluable help they’ve given her since her diagnosis. They organised funding to help her, which she plans to repay if she gets compensation. She continued: ‘I refuse to be defined by my illness. I’ve been given a sentence but I won’t give in to it. ‘I’ve kept very positive, and am surrounded by positive people. I’m not downbeat because there’s nothing I can do about this. Im happy to have had this opportunity of blogging these to lovely ladies and although they need help in different ways I pray this Awareness will help them to find the answers.